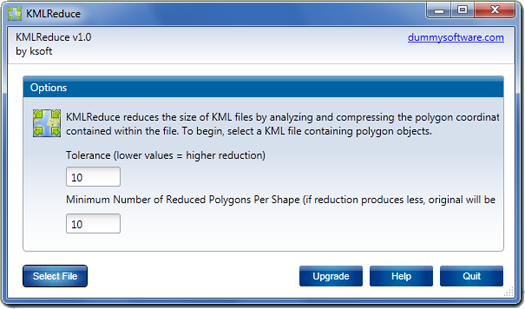 KMLReduce optimizes the size of KML files by analyzing, reducing, and removing coordinates from polygons contained within the file. This allows you to distribute the KML file online and use less traffic for users and services accessing the fille. KMLReduce works on KML files that contian polygon shapes with many coordinates. KMLReduce analyzes the points for each polygon shape and optimizes them using a variation of the Douglas Peucker algorithm. ...... Peucker algorithm. KMLReduce calculates the distance between each polygon shape latitude and longitude coordinates within the KML file to determine which points can be optimized and removed, while still retaining the original KML shape integrity. Reduced KML files contain far fewer polygon shapes than their original, yet still display correctly. KMLReduce is an easy solution to optimize and reduce the size of your KML files for hosting online. Qweas is providing links to KMLReduce 1.0 as a courtesy, and makes no representations regarding KMLReduce or any other applications or any information related thereto. Any questions, complaints or claims regarding this application KMLReduce 1.0 must be directed to the appropriate software vendor. You may click the publisher link of KMLReduce on the top of this page to get more details about the vendor.